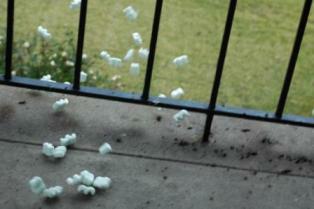 Packing peanuts – a very bad idea. They create a true environmental problem. Technically known as expanded polystyrene loose fill, they are messy, marginally effective for void filling and cushioning, exceedingly difficult to recycle or dispose of, and as you can see from these photos I took, hard to deal with. A helper and I spent 30 minutes picking up the mess. All I was trying to do was get a photo of the box and it blew all over. As you mail your Christmas and Hanukkah gifts, don’t be a doofuss and use this trash. Manufacturers continue to try alternative products. Anti-static peanuts eliminate static cling, helping peanuts go where they are supposed to go. Biodegradable peanuts, usually corn starch based, dissolve in water and produce no toxic waste. 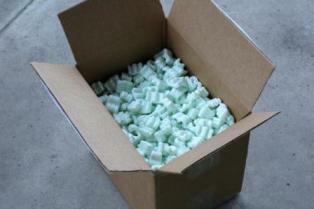 Paper peanuts, made from a variety of recycled papers are now available, but better packing peanuts are much like better deck chairs on the Titanic. “Loose fill” of any variety is still messy, doesn’t cushion well, and has poor void fill quality. Anti-static peanuts are expensive. 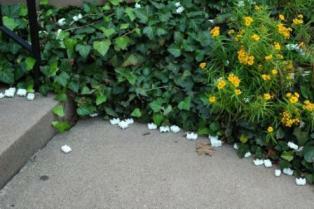 Many types of biodegradable peanuts are dusty and attract rodents. Paper peanuts are heavy, dusty, and hard to handle in bulk. And regardless of the chemical formulation, peanuts remain difficult for consumers to handle, recycle, and dispose of. AND – THEY BLOW ALL OVER THE PLACE! So………. Inflatable air bags: Several manufacturers offer systems which inflate small polyethylene air bags. They are clean, attractive, and light as air. They require little material, and polyethylene film is reasonably priced and easily recycled. Dunnage papers: Industrial papers such as brown kraft paper and newsprint are good for void fill and cushioning. Paper is inexpensive, easy to handle, and fast to apply. Most dunnage papers have 100% post-consumer recycled content and are easily recycled. Paper conveys a strong and positive environmental message. Multi-layer paper: Similar in concept to inflatable air bags, multi-layer paper systems bond two or three plies of paper and slightly crumple them to create variable or predetermined lengths of cushioning/void fill material. These "paper pillows" offer cushioning and void fill quality superior to plain dunnage paper and carry the same positive environmental impact. Bubble wrap: Probably the best choice is a pliable transparent plastic material commonly used for packing fragile items. Regularly spaced, protruding air-filled hemispheres "bubbles" provide cushioning for delicate or breakable items. The bubbles that provide the cushioning for fragile or sensitive objects are generally available in different sizes, depending on the size of the object being packed, as well as the level of cushioning protection that is needed. Some have self sealing properties like the example in the photo. Also for Holiday shopping, here's an easy way to give great natural organic gifts to your family and friends. Click here for some organic gift package ideas - Health & Nutrition and Gardening gift sets.